This bike was totally re-built with products we stock and sell. 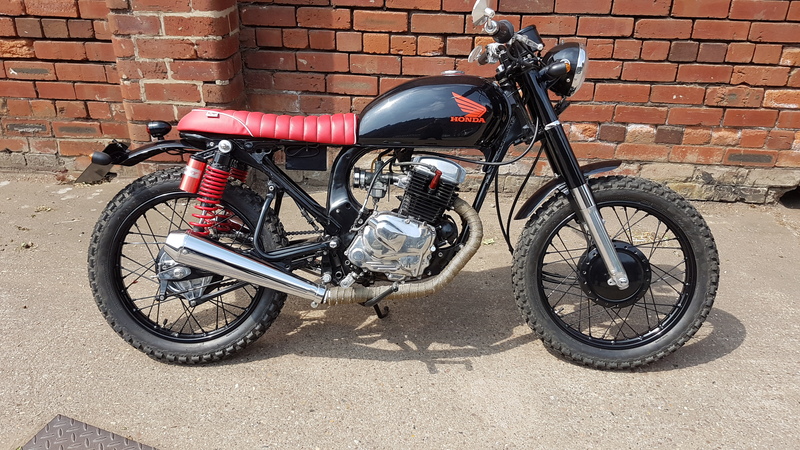 The Frame, Swinging Arm, Side Stand, Wheels, Brackets and Brat Handlebars were all Powder-Coated Gloss Black. The Tank, Mudguards, Headlight Bowl, Headlight Bracket and Fork Shrouds were all painted metallic Ford Panther Black. This is a very good looking bike that grasps attention everywhere it goes. When this stunning bike was sold, our office admin Siobhan wasn’t happy as she loved it that much she wanted it for herself!